(Nanowerk Spotlight) Ferroelectric liquid crystal (FLC) display technology holds the promise of fast switching times, a large viewing angle, and high resolution. Ever since Clark and Lagerwall invented the basic principle of ferroelectric liquid crystal displays back in 1980 ("Submicrosecond bistable electro-optic switching in liquid crystals"), much effort has been devoted to the development of FLC displays, aiming at practical applications particularly in consumer electronics. While conventional liquid crystal displays (LCDs) employ a nematic liquid crystal phase, ferroelectric liquid crystal displays utilize a chiral smectic-C LC phase with spontaneous polarization (read more about the concept of Ferroelectric Liquid Crystal Display; pdf). In the chiral smectic-C phase, LC molecules have a layer structure in which the mean direction of molecular long axis is tilted against layers. FLCs have a spontaneous polarization whose direction is perpendicular to the layer. When an electric field is applied, molecules re-align in a way the direction of the spontaneous polarization is the same as that of the electric field. Because of the direct interaction between the electric field and the spontaneous polarization, FLCs shows microsecond optical switching time – which is much faster than that of conventional LCDs. Figure 1: Electro-optical switching of FLC cells as a function of time. 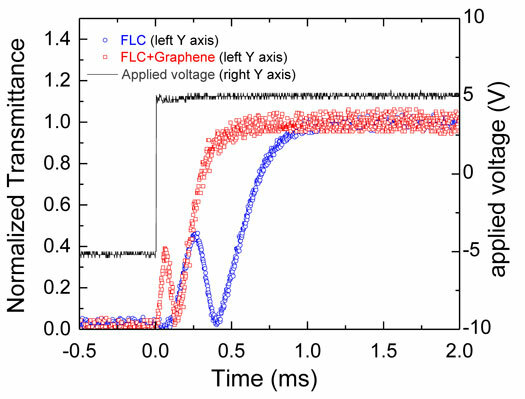 Left Y axis: Normalized optical transmittance as function of time for pure FLC and FLC+Graphene after the applied voltage is reversed. Right Y axis: The line represents the applied voltage profile across the cell as a function of time. Note, as the applied voltage is reversed from -5V to +5V at t = 0, the transmittance intensities start to increase, indicating the FLC cells’ optical transition from a dark state to a bright state (Image: Dr. Basu, US Naval Academy). The spontaneous polarization plays an imperative role in the electro-optic switching of FLCs. Rajratan Basu, an Assistant Professor in the Department of Physics at the United States Naval Academy, has developed a technique to amplify the spontaneous polarization by doping graphene into FLCs. The graphene-induced enhanced spontaneous polarization allows the FLC to switch even faster, as shown in Figure 1 above. He reports his findings in the September 17, 2014 online edition of Applied Physics Letter ("Effects of graphene on electro-optic switching and spontaneous polarization of a ferroelectric liquid crystal"). Dispersions of carbon nanotubes with liquid crystals have attracted much interest because they pave the way for creating new materials with added functionalities. In a previous Nanowerk Spotlight we reported on Basu's findings that carbon nanotube-doped liquid crystals result in faster LCDs. "Liquid crystal molecules can stabilize themselves on the honeycomb pattern of graphene due to a strong anchoring of π-π electron stacking, resulting from a similar molecular architecture between the LC and the honeycomb graphene surface," Basu explains to Nanowerk. "A small quantity of graphene flakes, with an average thickness of 2.15 nm and an average diameter of 1.75µm, in an FLC can enhance the order parameter of the smectic-C phase at the nanoscale." Figure 2(a) below schematically represents a natural smectic-C phase. Figure 2(b) schematically shows that a graphene surface can enhance smectic-C ordering by stabilizing both the positional order and the tilted orientational order of the FLC molecules, relying on the π-π electron stacking between the LC’s benzene rings and the graphene-honeycomb structure. This enhancement in smectic-C ordering can increase the overall spontaneous polarization in the FLC + graphene mixture. The spontaneous polarization is inversely proportional to the FLC switching time – thus, an enhanced spontaneous polarization results in a faster switching/response time. Figure 2: Schematic illustrations: (a) A natural smectic-C phase, (b) An enhanced smectic-C ordering on a graphene surface. 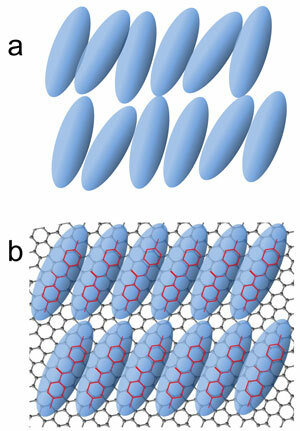 Blue ellipsoids are liquid crystals and the black honeycomb structure is a graphene surface. A generic molecular structure of a liquid crystal is shown in red in each ellipsoid. The π-π electron stacking is illustrated by matching the LC’s benzene rings on the graphene-honeycomb structure. (Image: Dr. Basu, US Naval Academy). Rotational viscosity of an aligned liquid crystal represents an internal friction among LC directors during the switching process. Rotational viscosity is an important parameter for many electro-optical applications employing liquid crystals – the response times of LC devices are linearly proportional to this parameter. Basu points out that the suspended graphene flakes reduced rotation viscosity by trapping some of the free ions of the FLC media. "As has recently been shown, a finite graphene sheet, with diameter <1µm, has a nonzero electrostatic fields near the surface," notes Basu. &The electrostatic fields decay only slowly with increasing size and are always non-negligible near edges." In Basu's experiments, the diameter of the graphene flakes has a range from 0.5µm to 3.0µm. Therefore, the electrostatic fields from these finite graphene sheets, mainly from those are <1µm, can capture some of the mobile ions in the LC media. The larger sheets can also trap some free ions on their edges due to the presence of non-vanishing electrostatic fields. "This process reduces the free ion concentration in the FLC," says Basu. "The presence of fewer ions reduces the rotational viscosity of the FLC media, enabling the FLC molecules to switch faster." These findings will open up new research areas, such as their potential applications in LC based electro-optic devices for a faster response. These results are also important for purifying LCs from excess free ions without additional chemical synthesis. This work was supported by the Office of Naval Research (Division 312: Electronics, Sensors and Network Research) under Award No. N0001414WX20791.